A soundtrack from out of the middle distance, Souls Adrift, in Disrepair (73'52") uses stillness to superb effect. Eyes Cast Down (multi-instrumentalist Greg Moorcroft) asks that you give his delicately layered performance your patience. Once we adjust our ears to the minimalist arrangements, what emerges is a slow steady tempest of sound. 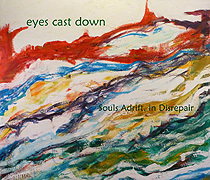 The five stark compositions found on Souls Adrift, in Disrepair evoke different questions from the ones we are used to. We are asked to look within, and think about what feelings and sensations we experience while listening to this album's sustaining drones, breathing chords, and dense forms - things large enough to swallow you whole. Whatever drama does arise on Souls Adrift, in Disrepair, does not come from harmonic displacement, melodic invention, nor counterpoint, but from contrasts in the sounds themselves. Stripped of almost everything, but for the subtlest shifts in atmosphere and light, this work opens up a space for one. 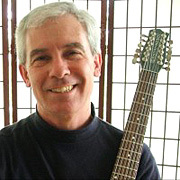 Moorcroft relies on a myriad of electronic processing devices to transform his guitar playing into the textural masses found on this album... and a learned musicianship to direct this technology. Beautifully restrained moments, borne in improvisation, extend in slowly decaying ripples beneath gradually undulating contours. Aural details come in and out of focus, in shades of twilight and sepulchral frost. As each tone breathes into our listening space, we feel a slow force of momentum. Near album's end, a reverberant piano enters, repeating its question again and again. When shadows pull together, ethereal voices add to an enfolding darkness. The reason this album seems so quiet is because there are so few other people saying these things. The unadorned beauty of Souls Adrift, in Disrepair relates to human fragility. The dark alliance of unmodulated sounds imparts a haunting force. As ideas and emotions cross borders, the outside world remains an abstraction - possibly a parallel present to the loftier firmaments of the mind.